Using Street View on Google Maps has revealed several surprises to viewers. Medieval sword fighting, scuba divers with pitchforks, and even Waldo have popped up on the map. Many of the images have been staged by people who knew the Google car and its numerous cameras would be passing through their area, but there have been a handful of photos captured and noticed by serendipity. Enter Patrick Pittenger and Sonya. Patrick developed a relationship with Sonya, a stray dog, by feeding her whenever he happened to see the pup. One day while using Street View, he noticed Sonya photographed on the sidewalk. He wondered if she lived near there and decided to call the rescue shelter Hope for Paws, to see about finding the dog. Shortly after, a rescuer went to the location and spotted Sonya. Following a short chase and some bribery with food, the rescuer was able to get Sonya in his vehicle and drive her to the shelter, where she was groomed and cared for on her way to a better home. You can read more of the story here and watch a video of the actual rescue. Big Woof to Patrick Pittenger, Sonya, and Hope for Paws. Give your pooch an extra helping of love with homemade dog treats. Consider trying this Salmon Delites recipe. Hint: Full moon. One word. 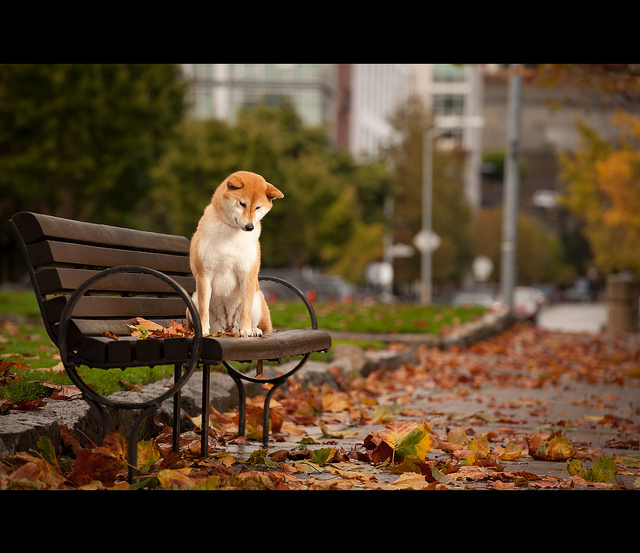 Simply a beautiful photo of a beautiful dog and a beautiful season. We hope you enjoyed walking with us today. Thoughts, recommendations, comments? Bark below, on Twitter, or Facebook. Woof!